EmeraldCityEDM | Paradiso 2015 with Armin Van Buuren & Skrillex! Paradiso 2015 is SOLD OUT! Paradiso 2014 was an incredible experience and an overall success. Many changes were made to compensate and allow for our festival to grow and flourish safely and successfully. We introduced increased security measures along with more conscious crew support in order to ensure that The Message was enforced and safety was kept as a prime priority. That being said, there was definitely a learning curve and we are aware that line queuing was a long and tedious process. We hear you loud and clear, Diso family. We determined from last year’s adventure that there not only needs to be changes to the entry lanes and security staffing, but there needs to be consistency in training across the line so that organization is fluid when it comes time to open our doors this year for Paradiso Festival 2015. Although attendee safety remains our top priority, rest assured that we take all aspects of our festival goer’s experience very seriously. -We have brought on additional security staff to work the entry lanes. -All of our staff members will be better organized to handle a mass of people as efficiently as possible. -There will be tents over the lines to provide shade. -We have added “no-bag” lanes, for those of you that will not have purses or backpacks. -We have added distinguished male and female lanes for a smoother process. -We have brought on additional Conscious Crew members to work the entry lanes. -Our Conscious Crew teams will be moving throughout the lines during peak hours to make sure people are staying hydrated. They will be checking for signs of dehydration and heat stroke before people enter the venue. There will also be a free water refill station in the line area. With all of this in mind, we want to stress that Paradiso pulls an extremely large amount of traffic, especially during peak entry hours. While this growth makes the experience bigger and better year after year, it also means there will ALWAYS be lines to wait in. Keep in mind that each and every one of you can add to our efficiency by briefing yourself and your friends on what can and cannot be taken into The Gorge before you get to the gates, reminding yourselves of the rules and regulations, and by being cooperative when it comes time for our staff and security to check your person and your belongings. If you want to bypass the bulk of the line, remember that busiest entry occurs from 2pm to 5pm. In addition, we will be opening Will Call on THURSDAY for any GA and VIP ticket holders as well as for Guest List. Grab your passes on Thursday when you arrive to camp! This will give you one less line to wait in on Friday. On Friday and Saturday, the days of the show, the box office will open at 11:00am and close at 10:00pm each day. We want to thoroughly thank you all for your continuous support as we all work as a family to ensure that the Pacific Northwest’s largest EDM festival remains as magical as ever. 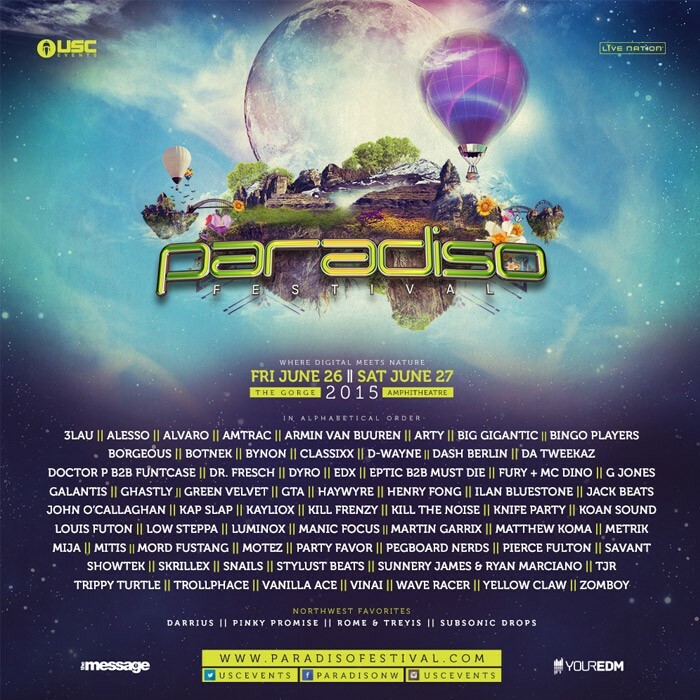 Go Green recycling & garbage initiative announced for Paradiso 2015! In an effort to reduce our carbon footprint and raise environmental awareness, USC Events introduces Conscious Community, a group of Team Green volunteers who promote proper waste disposal and recycling at our festivals. Conscious Community motivates fellow concertgoers through an incentivized program that allows for patrons to win apparel, festival passes, and everything in between. Remember, properly discarding the trash and recycle will not only assist USC Events in preserving the environment, but will also allow for concertgoers to be awarded for their environmental stewardship. Conscious Dollars: We’re excited to introduce our Conscious Dollars program! Stop by our Conscious Community booth inside of Paradiso Festival 2015 to receive a recycling bag. For every 10 recyclables you bring to the Conscious Community booth, you will receive a Conscious Dollar. Conscious Dollars can be exchanged for prizes, including aluminum USC water bottles, Celestial VIP upgrades, or even 2015 FreakNight VIP passes! Campsite: A large portion of waste comes from the campsite, which can get scattered around and left in the grass. USC Events is challenging you to keep your campsite clean! On Sunday, a group of our Team Green spotters will roam the campgrounds, looking for the cleanest campsites. They will be armed with a sweet load of prizes, including FreakNight 2015, Resolution 2016, Lucky 2016, and Paradiso 2016 passes! Winners will be featured on our social media pages. Check out the EmeraldCityEDM Contests & Giveaways page for more opportunities to win. Update June 10th, 2015: Paradiso 2015 is officially SOLD OUT. Hard Copy Tickets: A limited quantity of Paradiso tickets were available on Tuesday, March 17th, but have since sold out. No more hard copy tickets will be made available, purchase your tickets online or at a Ticketmaster retail outlet. Plenty of regular priced tickets remain. Stay tuned to this post for more information about Paradiso 2015. 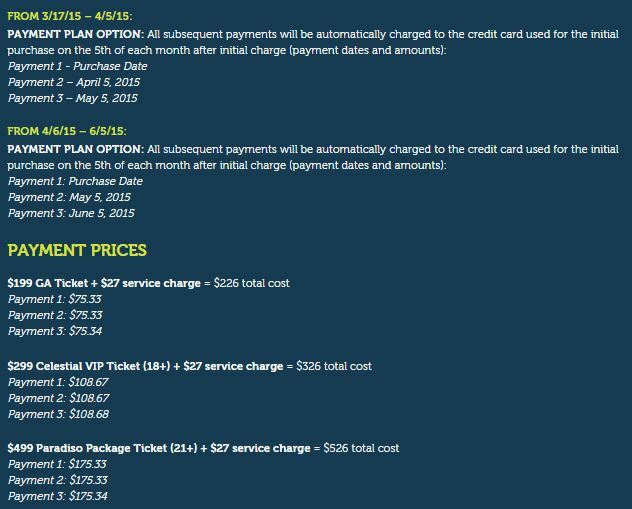 Camping passes will also go on sale March 17th, however in the past it has been cheaper to buy your car camping pass at the gate to avoid paying service fees. 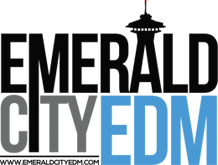 Don’t forget to stay up to date on local EDM events in the Seattle area by following the EmeraldCityEDM Events Calendar and enter to win free tickets to local EDM shows by following our Contests & Giveaways page. Hard Copy Tickets Update: A limited quantity of Paradiso tickets were available on Tuesday, March 17th, but are now sold out at all retail outlet locations. No more hard copy tickets will be made available, purchase your tickets online or at a Ticketmaster retail outlet. Plenty of regular priced tickets remain.